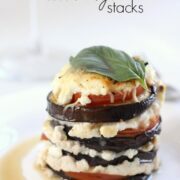 Since I so much enjoyed getting my fancy pants on with my stuffed crepes last week, I thought I’d try them on again with these cheesy aubergine stacks. These would make the perfect elegant starter for a dinner party, but to be totally honest, considering how rarely I throw dinner parties, you’re far more likely to see me scoffing down a whole plateful of these as a meal in itself – probably looking very inelegant in the process. These really were delicious – I ate mine in about twelve seconds flat. 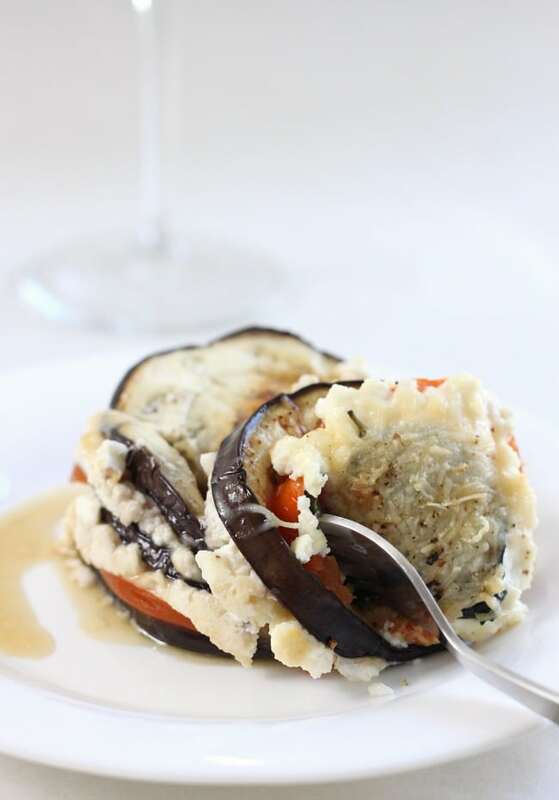 Juicy vegetables with creamy ricotta, fresh basil and parmesan cheese… I couldn’t help myself. Don’t forget the glass of white wine! As well as looking painfully pretty, the whole ‘stacking’ thing does actually serve a real purpose too. I’ve tried to make similar dishes in the past, with layers of aubergine, tomato and ricotta in casserole format, but they’ve always ended up a bit wet and soggy. 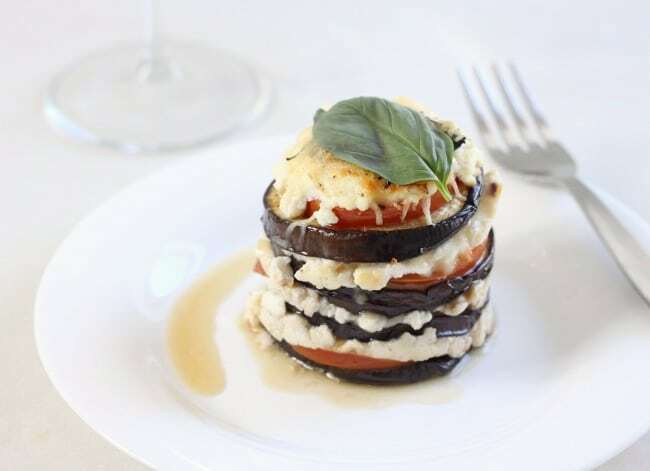 No matter how much you pre-cook your aubergine, all the different ingredients are going to release some liquid during cooking, which isn’t ideal – and a soggy casserole is pretty tricky to recover. However, stacking your vegetables up in this way means that any liquid drains away to the bottom, leaving you with perfectly juicy but not remotely watery vegetables. Success at last! I built up my stacks in some food rings (these ones, actually), but if you don’t have any, you could always go freehand. Depending on how steady your hand is, you might need to make a few shorter ones rather than these tall ones! I have a feeling that if I hadn’t had my rings, disaster would probably have occurred. You know when you can see something slowly falling over in front of your very eyes but you know you can do absolutely nothing to stop it so you just have to watch it be destroyed? Yeah, it would have been like that. So I’d recommend getting yourself some rings unless you’re a champion freehand stacker. Of course, after you’ve spent enough time gazing at the beauty of these perfectly stacked vegetables… half the fun is knocking it down. First, cook your aubergine slices. I cooked mine in a dry frying pan over a fairly low heat - just a few minutes each side until soft and lightly browned. 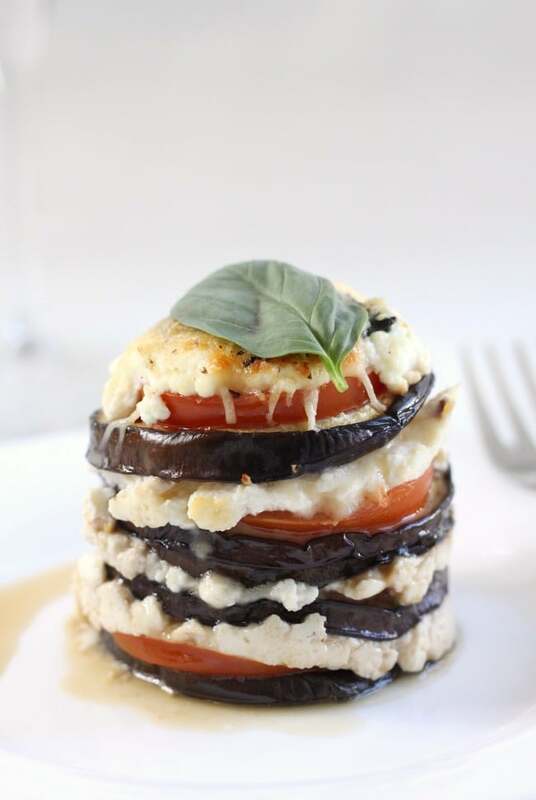 If you prefer, you could cook your aubergine under the grill (broiler). 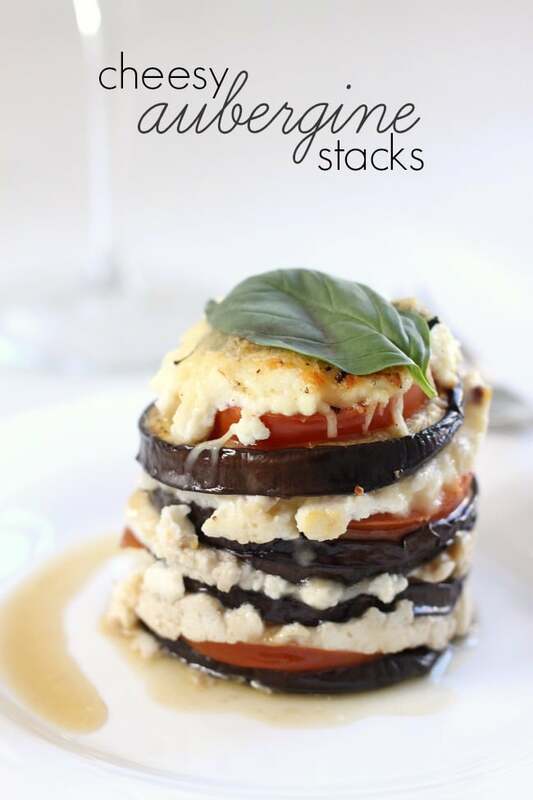 Once you've cooked your aubergine, it's time to create your stacks. Using a couple of oven-proof food rings if you have them, layer up the aubergine and tomato slices with dollops of ricotta, pinches of parmesan cheese and fresh basil leaves - I ended up with about four layers of each ingredient in each stack. I finished with the last of the ricotta and one final basil leaf, and topped each stack with a little more parmesan cheese and some black pepper. Place in the oven at 200°C (Gas Mark 6 / 400°F) for around 30 minutes, or until the cheese topping is golden brown. Transfer the stacks, still inside the rings, to serving plates, and then gently lift off the rings. Garnish with more fresh basil if desired. Prefer a canapé-style appetiser? 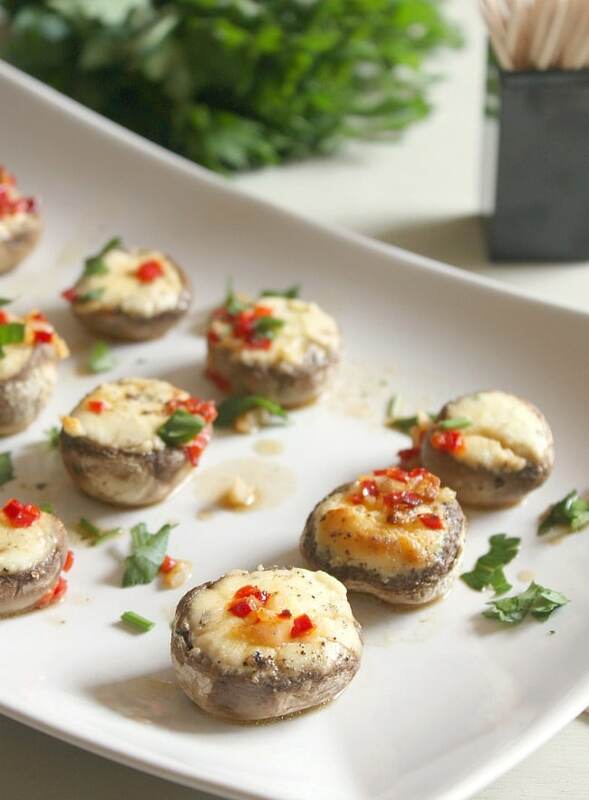 Try my Boursin stuffed mushrooms in chilli garlic butter! I love the way the rings come with a pusher to help you get the food out. I think even I might manage to get a pretty tower rather than one from Pisa!! Sounds like a tasty combination. I love everything about this! Great idea to use the food rings.